Following a great harvest jamboree last weekend, here are more details and links to a couple of the events mentioned. Good Food march to Brussels: A group of people from the UK will be joining to good food march to Brussels on the 19th September. The march is composed of people from all over Europe who want to demand a CAP reform that supports small-scale sustainable farming. There will also be some actions in the UK, including actions in London on the 17th and Norwich on the 16th. For more information on the march see: www.goodfoodmarch.eu Costs for travel to the demonstration by coach can be funded. Contact Haidee-Laure on hgiles@waronwant.org for information about travel subsidies. 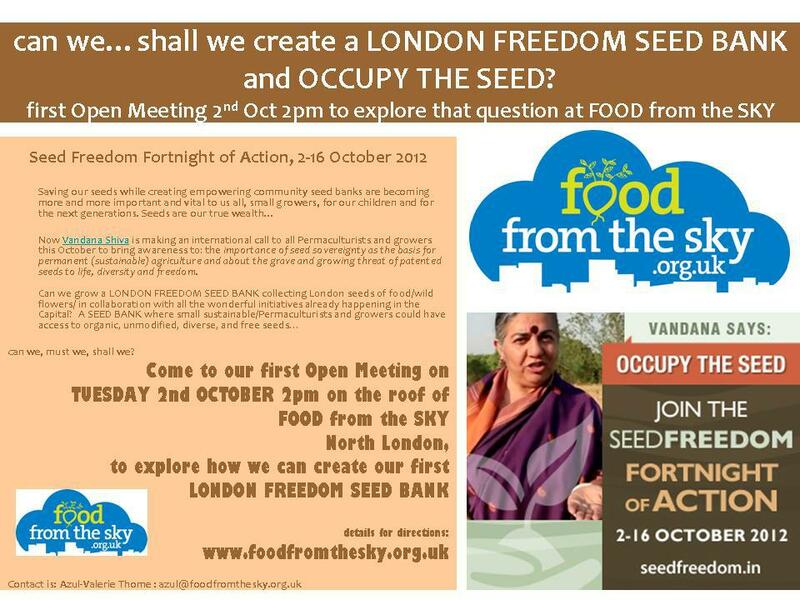 London Freedom Seed Bank: to coincide with the global seed freedom fortnight of action (2-16th October), food from the sky are holding a public meeting on the 2nd October in crouch end to discuss setting up a London seed bank where growers could gain ‘access to organic, unmodified, diverse and free seeds’. More info on flyer below, click to make it big!